Trust, both interpersonal trust, and trust in institutions, is a key ingredient of growth, societal well-being and governance. 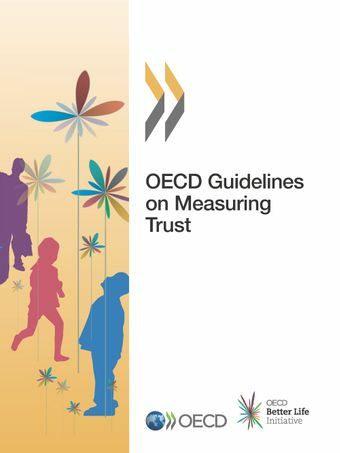 As a first step to improving existing measures of trust, the OECD Guidelines on Measuring Trust provide international recommendations on collecting, publishing, and analysing trust data to encourage their use by National Statistical Offices (NSOs). The Guidelines also outline why measures of trust are relevant for monitoring and policy making, and why NSOs have a critical role in enhancing the usefulness of existing trust measures. Besides looking at the statistical quality of trust measures, best approaches for measuring trust in a reliable and consistent way and guidance for reporting, interpretation and analysis are provided. A number of prototype survey modules that national and international agencies can use in their household surveys are included.These Guidelines have been produced as part of the OECD Better Life Initiative, a pioneering project launched in 2011, with the objective to measure society’s progress across eleven domains of well-being. They complement a series of similar measurement guidelines on subjective well-being, micro statistics on household wealth, integrated analysis of the distribution on household income, consumption and wealth, as well as the quality of the working environment.